Iliotibial band syndrome (ITBS) is a common athletic injury that affects runners, cyclists and weightlifters, and is a common cause of knee pain in runners. The thick, fibrous IT band runs down the side of the leg, beginning outside the pelvis, and traveling over the hip to end just below the knee. The IT band plays an important role in knee stability during running, moving from behind to the front of the femur with each stride. Continual rubbing of the IT band over the lateral condyle of the femur coupled with repetitive knee movement can cause the band to become inflamed, resulting in pain at the side of the knee. In the past ITBS was thought to be caused by tightness or insufficiently supportive footwear, and stretching and orthotic shoe inserts were commonly prescribed solutions. However, it is now known that the IT band is firmly affixed down the side of the leg, and cannot be released by stretching or manual therapies. Because of the location and length of the IT band, many factors can contribute to ITBS. In conjunction with clinical exam, diagnostic ultrasound can provide an accurate diagnosis of ITBS, while ruling out other causes of pain such as bursitis or tendinopathy. Computerized gait analysis can provide useful information about faulty gait mechanics that lead to ITBS, which is the primary cause of the condition in runners. In addition to classic soft tissue treatment of rest, ice, compression and elevation, physical therapy is the best way to resolve ITBS and restore healthy function. A good rehabilitation program for ITBS will re-educate your body in coordinated muscle recruitment and improved movement mechanics. At NYDNRehab, we go beyond treating your pain to correcting the source ITBS, to restore optimal function and performance. Iliotibial Band Syndrome (ITBS) is a common injury that plagues runners, cyclists or weight-lifters (especially during squats). ITB syndrome is one of the main causes of knee pain in runners. The IT band is a thick band of fibrous tissue that runs along the outside (lateral) part of the knee, extending from outside the pelvis, over the hip and ending just below the knee. The band is extremely important in stabilizing the knee during running. During activity it moves from behind the femur (thigh bone) to the front of the femur. The continuous friction (rubbing) of the band over the lateral femoral epicondyle, paired with repeated extension and flexion of the knee could cause the area to become inflamed. The pain is typically felt on the side of the knee and not in the hip of the thigh. 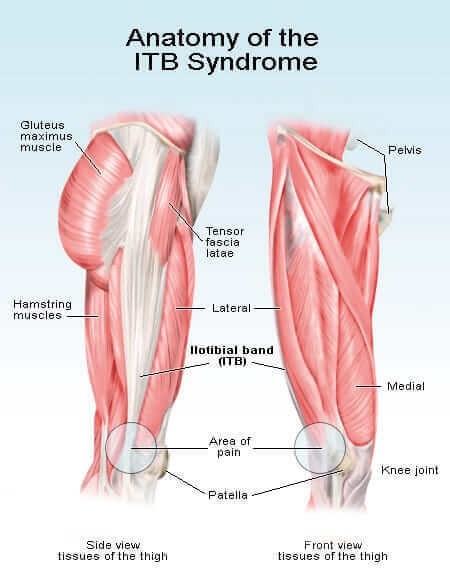 ITB syndrome is believed to be an overuse injury. Some cases of IT band pain can be so debilitating that a runner will have to completely stop for several weeks at a time or more. The stinging feeling that is felt above the knee joint on the outside of the knee. At times the pain may strengthen over time and may not be felt in the beginning or during activity. In some instances the IT band pain may be felt above or below the knee, where it attaches to the tibia. While the causes of ITBS may vary on a person by person basis and at times more than one cause may be a factor in falling victim to Iliotibial band pain. Some causes may be a combination of biomechanical tissue, weekly mileage, training methods, personal muscle imbalance etc… Keep in mind that you do not to have a knee specific knee injury to have ITB syndrome. Tissue injury complex must be identified. A diagnostic ultrasound may be the most useful modality to differentiate between tendinopathy or bursitis at the site of injury. By addressing these two factors it is important to minimize stress of the ITB and in turn it will reduce the risk of injury. When IT band syndrome is acute therapy options could be rest, ice, and elevation. to minimize and reduce the swelling and pain combined with stretching. ITBS treatment could be a combination of several ITB physical therapy modalities that will result in a wider range of motion and improved comfort and reduced pain. Iliotibial band treatment should include removal of adhesions with myofascial release techniques such as ART, graston and others, custom foot orthotics which would control the medial rotation of the foot and in turn reduce the rotation of the knee and leg. Too much rotation of the knee creates friction of the band against the other part of the knee. A compression wrap can also be utilized to help stabilize the knee where the tendon contacts to the patella. Multiplanar muscle stretching and hip abductor strengthening. Gait and running analysis is very helpful in diagnosis and planning of rehabilitation as well as running technique retraining.